“It is hard to believe how Nafesa has transformed in a few months. The once-energetic child who would run behind me, chattering non-stop, is now mostly confined to her bed as she cannot walk a step due to weakness. Her limbs have become so frail that even sitting up on her own has become a painful ordeal. Her laughter used to fill our days with joy, now her cries do not let us sleep at night. 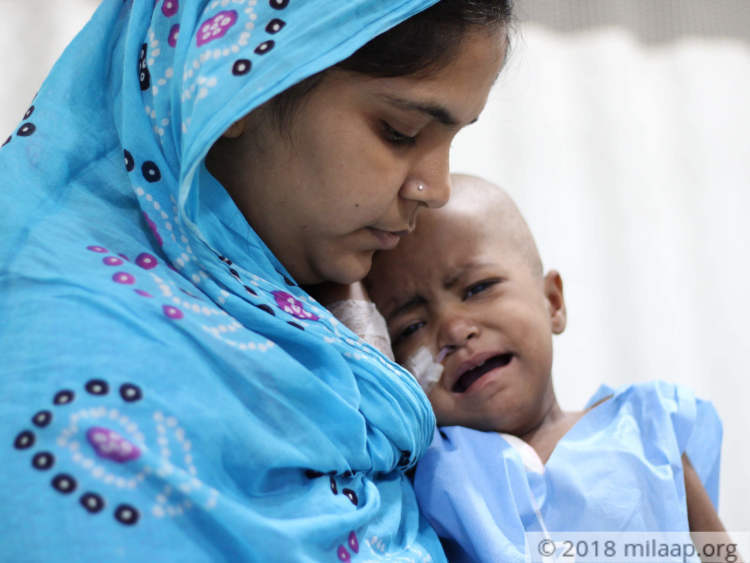 Cancer is killing our child, but we are running out of money to save her before it is too late.”-Shabiya, mother of 2-year-old Nafesa. On February 10th this year, Nafesa was not feeling like her usual cheerful self. She had developed a slight swelling of her eyelid that was accompanied by high fever. 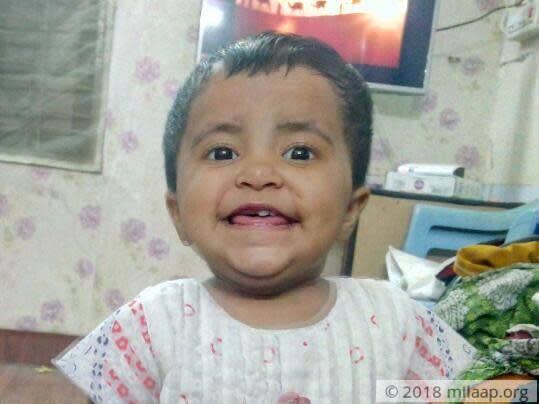 Her parents, Abdulla and Shabiya, took her to a local clinic in their hometown of Kancheepuram immediately. The doctor prescribed medicines for 4 days and assured them that Nafesa would be fine in no time. 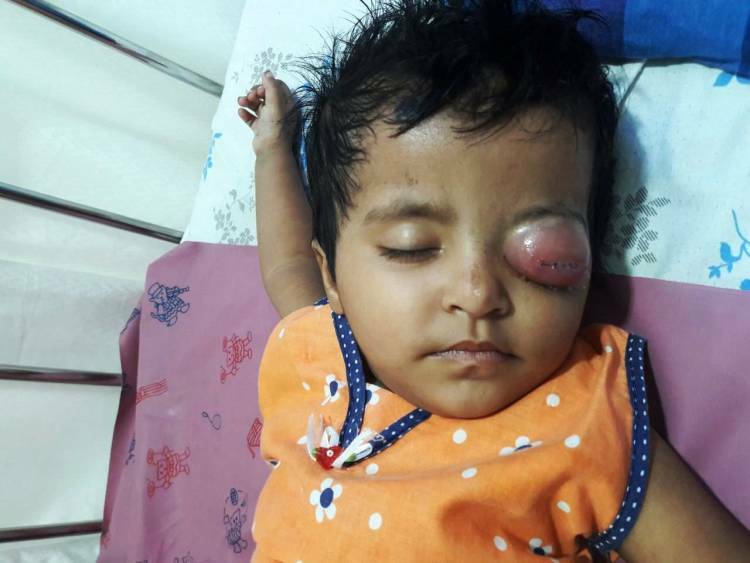 However, little Nafesa’s fever did subside, but her eyelid swelling became worse. At first, the swelling was the size of a small ant-bite. But in just a week’s time, it started becoming bigger and bigger. We were really concerned about our little baby girl – she was also growing more irritable and restless because of it. When she did not get better from taking another round of medicines, I decided to take her to Chennai for better treatment."-Abdulla. 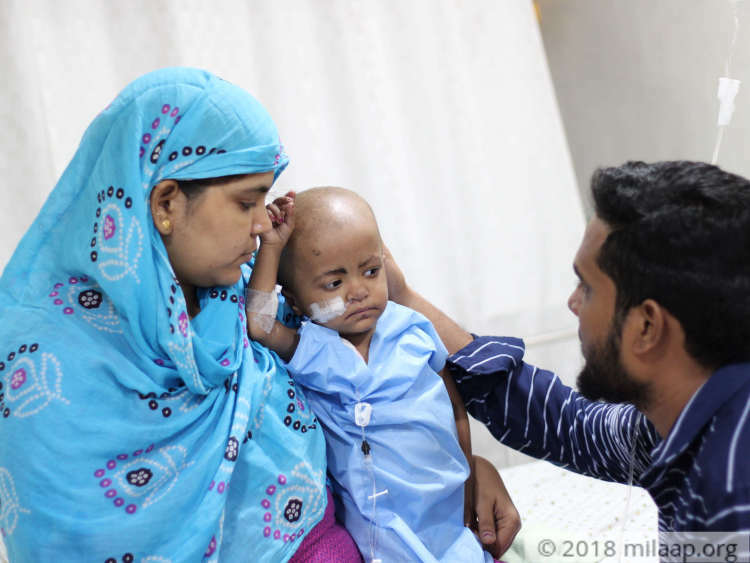 Abdulla and Shabiya took Nafesa to a couple of eye clinics in Chennai with no success - her swelling had almost grown to the size of a guava and doctors were not able to correctly point out what was wrong with her. Many said that her swelling contained pus and they even prescribed antibiotics and other strong medicines, but nothing seemed to work. Her left eye had been fully engulfed by the swelling (though it went away later) before a tissue sample tested positive for cancer of the lymph nodes. Her unassuming parents, who were emotionally and financially drained already, did not take the news well. “All this while, I wanted to believe that her weakness and exhaustion must have been from all the travelling. When the doctors said she had cancer, I broke down instantly. She was not a kid who got sick regularly – she hardly get a cold even. My husband did not say anything but I could see fear in his eyes – I know how he had struggled to pay the bills at the hospitals we visited so far. Now we had a more difficult struggle ahead of us.”-Shabiya. Nafesa’s current condition is a painful reminder of what happened to their first-born, also a baby girl, who died due to misdiagnosis. Abdulla had tried everything in his capacity to save her, but she was taken away from them a couple of years back. 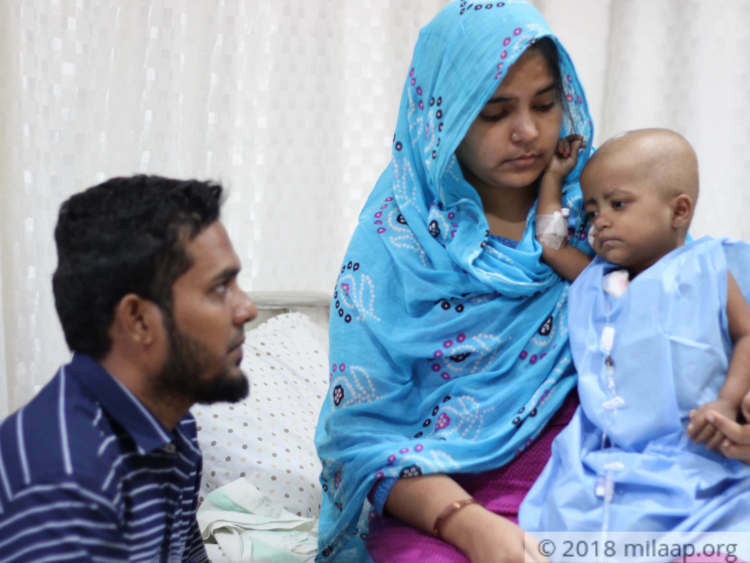 With Nafesa’s birth, Abdulla and Shabiya hoped to rekindle their parenthood and take care of their angel in every possible way. But as fate would have it, even Nafesa’s life is in danger now. “We cannot lose another child. We will not forgive ourselves if that were to happen. Thankfully, Nafesa’s condition is diagnosed and with proper treatment, she can live – the only obstacle is affording that treatment.”-Shabiya. Abdulla works in a small stationery shop in Kancheepuram. 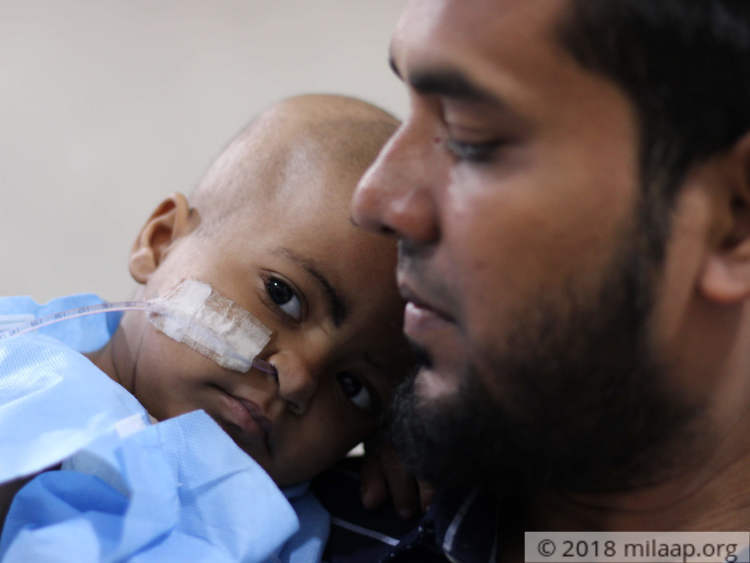 When doctors in Chennai told him that Nafesa had to be started on chemotherapy immediately, he did not think twice – he quit working for a few months as there was nobody else to care for his daughter. He even borrowed money from local moneylenders at high-interest rates, because he did not have savings and his requirement was urgent. 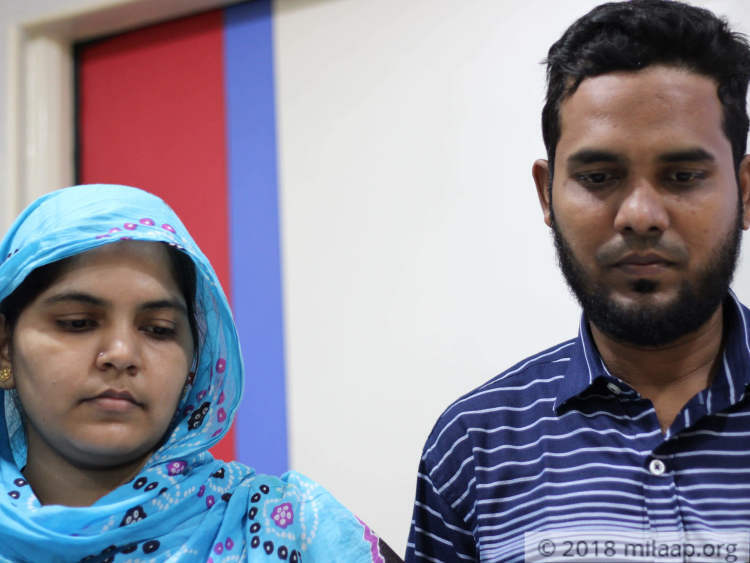 Though that amount was hardly enough to meet daily expenses satisfactorily, it was enough to keep Nafesa’s treatment going till now – that was the most important thing for Abdul. But now, he does not have enough money to save his daughter. He has knocked on many doors, without no response. “I don’t know what to do. I have not been going to work regularly and have already incurred a lot of debt. If my daughter does not get continued chemotherapy, she will die. I cannot let that happen – plese help me.”-Abdulla, with tears in his eyes. Little Nafesa is no longer the playful child that she was before cancer came for her. She has lost so much weight. She cannot eat well because of the port inserted in her chest. She is too weak to move in her bed and cannot even express to her parents how tired she feels. Nafesa cannot survive without prolonged chemotherapy, but her father Abdulla has already spent everything he had and even borrowed a lump sum, which is not enough to fund her treatment. Nafesa is doing well now. She underwent four cycles of chemotherapy and now the chemotherapy has been stopped. The doctors says that they will be able to decide the future course of action once the PET scan is done. The scan has been scheduled for 2 weeks from now. While she was undergoing chemotherapy she had a lot of side effects such as upset stomach, which led to dehydration. She also lost a lot of weight. It is my humble request to you all to please keep praying for my daughter. Thank you for the love and support you have shown towards Nafesa. 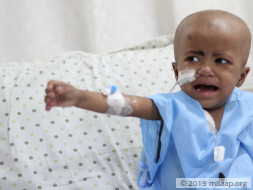 Nafesa has completed her fourth cycle of chemotherapy and currently is at the hospital as she requires supportive care to nullify the side effects of the chemotherapy. Doctors are of the opinion that she needs to undergo PET scan so that they can track the improvement and can decide the future course of action. Will keep you posted. Thank you for the wonderful support you have shown towards Nafesa. Here is an update on her health. 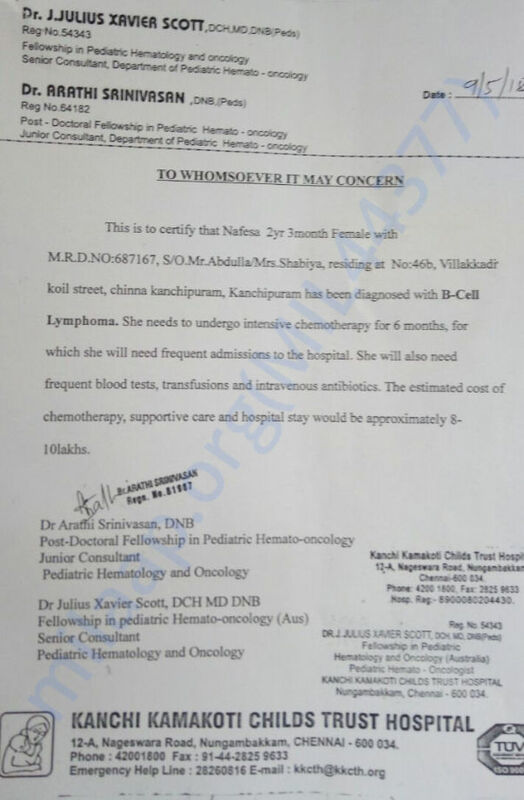 She has undergone three cycles of chemotherapy and is currently undergoing fourth cycle. She is responding well to the treatment, however, there are a few side effects like loose motions, and she has lost weight. Doctors will decide the future course of action once she has finished her fourth cycle.